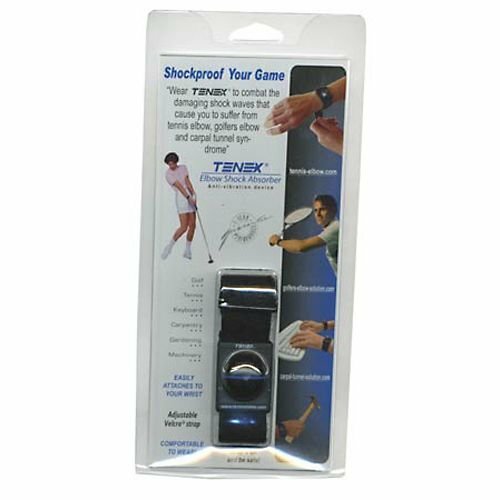 I have been using the Tenex ATESA Elbow Shock Absorber for 6 months now and am happy to say that I feel a noticeable difference with my tennis elbow arm. I started feeling the pain of tennis elbow or lateral epicondylitis a few years back when I was playing with a Babolat pure drive (older version that was stiffer) and a full bed of poly strings. Eventually it got so bad that I went to a sports doctor and received a cortisone shot to reduce inflammation. I waited 6 months and did physical therapy and iced while taking Ibuprofen for the inflammation and pain. It was debilitating and frustrating not being able to lift a cup let alone play tennis. While in rehab pain, I did a detailed search on the web and found many players suffered tennis elbow due to the stiffness of a full set of poly strings and stiff racquets. I decided to return to my old Prince Original Graphite that was rated in the Silver category (see link racquet stiffness ratings) of elbow friendly racquets and re-strung my racquet with a full set of natural gut. After a month off and an okay from my sports therapist, I began to take it slow and see if I could play again. While tennis elbow has never returned to the level of pain that previous stopped me from playing, I would often feel a soreness in my elbow from overuse and could tell that if I didn’t slow down I would definitely invite the monster back on the court. Previously my sports therapist recommended the Bandit compression strap which I still use often and found to work well. A friend of mine who plays USTA had the Tenex wrist band and I asked her about it. She explained that she had tennis elbow and found this technology helped her. The wristband reportedly absorbs these vibrations before they have a chance to reach the soft tissues of your wrist and elbow. A specially formulated liquid metal sealed inside the product, produces a “counterwave” action that effectively neutralizes vibrations whenever your arm receives a shock. My understanding is if there was less vibration reaching my elbow there is less need to compress the tendon with the Bandit. I immediately searched amazon and used my prime membership to get one with two day shipping. When I started wearing it, I found there was a noticeable difference after I played for a couple hours and I seemed to have less elbow soreness. I also noticed that as an added benefit my shoulder was also less sore. I assume that the Tenex wristband helps reduce vibrations that would also create soreness in the shoulder as well. The Tenex website (www.tennis-eblow.com) states that in five separate studies conducted by independent researches, the reduced vibration effect was verified. If there is a negative to wearing this wristband it might be in the comfort area. The weight of the wristband is 1.25 ounces or 36 grams. The band itself is not uncomfortable to me but I can understand people who say to me, they couldn’t imagine wearing a wristband such as this playing tennis. My response is that if I didn’t get used to wearing this wristband while playing I might not be able to play at all. It’s an easy tradeoff decision for me. It is definitely less cumbersome than the elbow compression type armbands. I am happy to report that the Tenex wristband also comes with a full one year warranty which I put to the test when a piece of plastic which holds the Velcro strap in place broke. I emailed the company and let them know of the problem. They responded quickly and did not require me to send the initial broken plastic case back in order to have a new wristband sent to me. I hope that I can play tennis for many years to come and technology like the Tenex wristband will help to make that possible. I highly recommend the use of the Tenex wristband for anyone suffering from tennis elbow. I have personally sensed a reduced amount of pain and soreness in my arm since using it and could not imagine playing tennis without it. Thanks for reading! You can purchase this product here on Amazon through our affiliate program and support our mission!